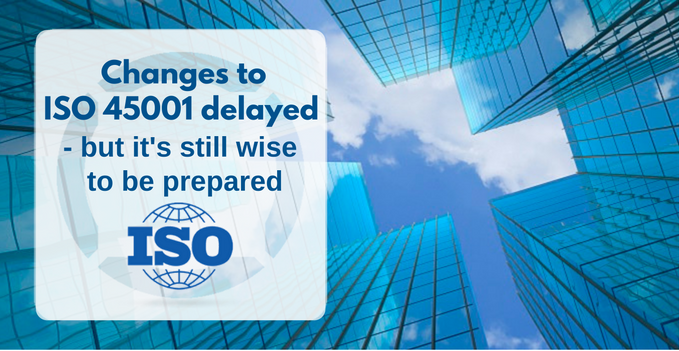 Changes to the new ISO 45001 Occupational Health and Safety (OH&S) Management Standard have been delayed after participating members of the International Organisation (ISO) committee 'disapproved' the first draft. Only 71% voted in favour of it against a requirement of 75%, so concerns will now have to be addressed and resolved and the revised version put up for further consultation and ballot. The importance of ISO 45001 cannot be underestimated and EDP is looking forward to the changes being approved and implemented. As expert health, safety and environmental consultants, we can help your organisation understand the changes to the new ISO 45001 standard and guide you in achieving accreditation. The Standard is intended to enable organisations to better manage their OH&S risks and improve their OH&S performance and will replace OHSAS 18001 as the definitive OH&S Standard. ISO 45001 will provide a clear framework for organisations wishing to manage OH&S risk effectively and eliminate or minimise injury or ill health to the people that may be affected by its activities, particularly those performing these activities as part of their occupation. In addition to reducing accidents and ensuring people are safer and healthier, implementation of ISO 45001 will enable organisations to support sustainability initiatives, improve overall performance and increase profitability at the same time. • ISO 45001 is aligned with ISO 9001 (Quality Management), ISO 14001 (Environment Management) and builds on 18001, a framework aimed at controlling risks. • It will work in organisations regardless of size, sector and culture. • "Plan, Do, Check, Act" (PDCA): Organisations will be required to achieve continuous improvement in Health and Safety management through senior management leadership commitment and worker participation. EDP can work with you in reviewing your policies and procedures and getting your management systems in place, so that your organisation is ready to achieve accreditation when the time comes. EDP are here to help your organisation get started.